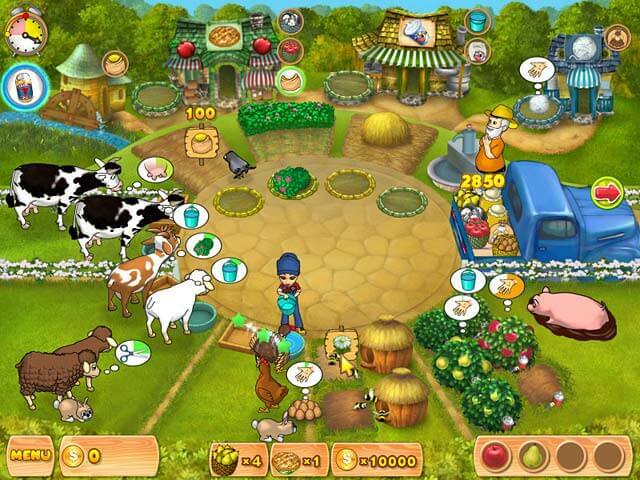 Expand your farm, and fill it with the latest tools for all your farming purposes. Anna and Bob are back again, this time traveling around the world on vacation along with their grandparents. During their travels, Anna caught wind of a farming contest in Australia, and they all decided to join in the fun. Take on the reins and help the family snag that delicious Gold cup. 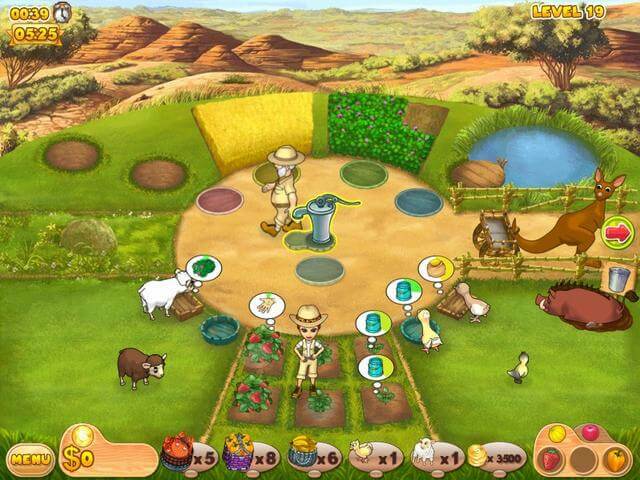 Travel to different countries, and explore a great flavor of vegetables and fruits to plant, not to mention a selection of farm animals to breed. Each member of the family has a specific role in the farm, but you will start things off simple with Anna and Grandpa. Anna tends to the vegetables, whereas Grandpa mans the water pumps and fruit trees. The mechanics of the game is pretty straightforward once you get into the routine. First off, you will want to direct Anna to plant some seeds into the given plots. Grandpa will pump up water into buckets which Anna will then carry over to water the planted seeds. Be mindful that Grandpa can only fill up one bucket of water at a time, so make sure that Anna takes that bucket before asking Grandpa to fill another one. Once watering is done, the plant will take some time to grow in which time Anna has to do some weeding. After the plant is matured enough to be harvested, Anna can then carry the harvested produce to the nearby cart wagon, which will be carted off to the nearby market to be sold for money. Anna can only carry two plots’ worth of produce in a go, so be sure to manage your time accordingly while moving the crops. Be aware that your crops will attract lemurs, who will steal and ruin your crops if they get too close. Rest assured, you can scare them away by tapping on them, and by tapping several times you can scare them away for good. 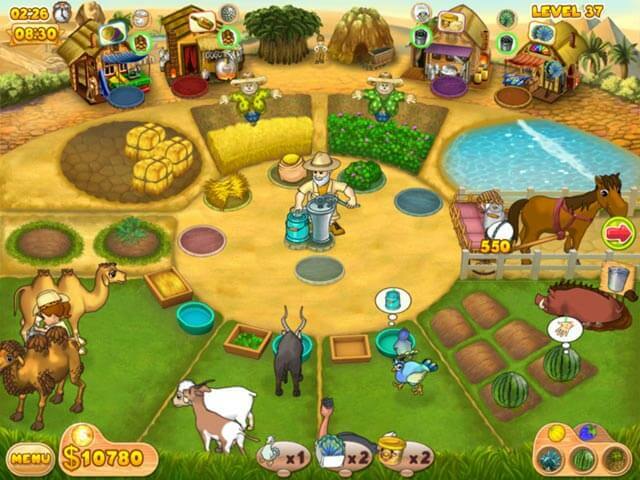 Aside from planting vegetation, you can also rear farm animals, such as geese. Simply provide water or grain to a gosling and watch it grow over time into a she-goose. When it is time, you can collect the feathers from it and sell them for a good price in the market as well. There is a timer for every stage, in which you will have to complete the required goals to finish the day. You will have to manage every task keeping in mind of the timer for every task before they run out, such as watering the seed, weeding the crops, harvesting the crops, and so on. Basically, prepare ahead for tasks that you already know is going to pop up, and manage the family members well in their respective roles. Do note, however, that you will only be able to play a certain number of stages for free before being prompted to choose one of two options if you would like to play more. You can either watch an advertisement to play 1 more stage, or purchase the full game. Fans of time-management games will probably delight in this game. If you are willing to part with some cash for such a game, why not give it a try?